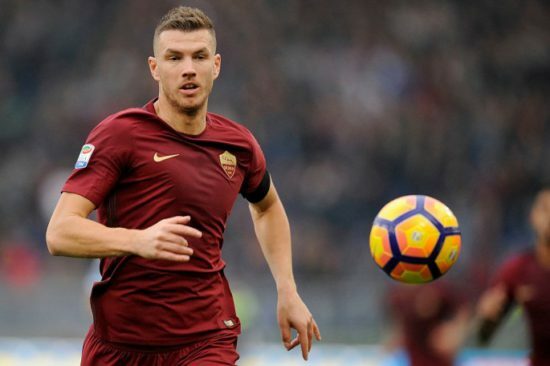 Bosnian international Edin Dzeko will reportedly complete his move from Serie A side, AS Roma on Thursday. The Blues have been in the hunt for a striker this transfer window to support misfiring striker Alvaro Morata who has failed to score in any of his last six games across all competitions. The west London club have been heavily linked with host of Premier League forwards including the likes of Peter Crouch, Andy Carroll, Fernando Llorente, Ashley Barnes and Marko Arnautovic but none seems to have materialised. However, the Premier League champions have now stepped up chase for former Manchester City striker, Edin Dzeko who they believe can provide stiff competition for out-of-form Spanish forward, Alvaro Morata and will definitely add quality to the Blues attacking options given his brilliance in front of goal and his proven Premier League experience. Reports from Italian news outlet TMW claim that the Bosnian forward is expected to fly into London on Thursday to complete his winter move to Stamford Bridge with little details left to be sorted out before the end of the today. The 31-year-old left the Premier League for a reported fee of €11 million in the summer of 2015 to join Serie A outfit, AS Roma but has established himself as one the deadliest strikers in the Serie A having scored a total of 61 goals in 116 appearances since he made his debut for the Galliarossi in a 1-1 draw away at Hellas Verona. He is known for his finishing, link-up play, excellent heading abilities, aerial prowess and long shots.